There are occupations that deserve great regards, admiration and respect – men in Khaki, the Police Force stands on the top drawer alongside armed forces that guard the Nation. Theeran Adhigaaram Ondru is doing rounds in the silver screen and has received some positive reviews. Amidst the heightened negativities, the khaki-clad, gun-wielding cop has commanded respect. 3 decades and more ago, came ‘Thanga Pathakkam’ in which Sivaji Ganesan played the honest police officer S.P.Choudhry; there have been films with hero as Police Cop and this is no post on Cinema ~ but on a real life incident that shook us today. In some ways, it was cruel fate – otherwise not much to connect the 2225 odd kilometers that the city of Pali in Rajasthan, away from Chennai is. Tamil Nadu Police Department is the primary law enforcement agency of the State that has more than a century old history. In some ways, the engagement by Pedda Naik to guard the town of Madrasapatnam way back in 1659 was perhaps a precursor. Close on the heels of Indian Independence struggle, Madras Dist Police marked the beginning of Modern day Madras Police. With the implementation opf Madras District Police Act XXIV in 1859, new recruits were inducted in the police force. There are crimes - Nathuram and Dinesh Choudhary -- drilled a hole from the roof and stole valuables from Mahalakshmi jewellery store in Kolathur. Initial investigation revealed that the accused belonging to Northern part of the country had rented the place in the same building. Though the jewellery store owner did not have their details, CCTV footage helped the police identify the accused. Sooner, four relatives of Nathuram were detained and the Tamil Nadu Police formed a special team to nab two more accused. Media reports suggest that the police got information that the suspects were hiding in a deserted brick kiln. A team of seven officers then headed for Pali's Jaitaran, about 238 km from Jaipur, where they managed to catch hold of one of the alleged robbers. When the accused was being taken out of the compound, he snatched Mr Periyapandi's service revolver and opened fire. The inspector died on the spot while others suffered serious injuries. They were rushed to a nearby hospital. The man who lost his life is Mr S. Periyapandi, Law and Order Inspector of Madhuravoyal in Chennai city. Born in 1969, Mr. Periyapandi joined the force in 2000 as a direct Sub-Inspector. He was promoted as an Inspector in 2014. In the firing by the criminal Naturam and his aides, Periyapandi was wounded fataly, Kolathur Inspector T.M. Munisekar was injured. Reports further suggest that at around 2.30 am, the police team nabbed main accused. The persons who were living with him in the premises opposed the team from arresting (the suspects) and a scuffle ensued between both sides. Physical blows (were) exchanged between them. One of accused beat and Munisekar fell down. 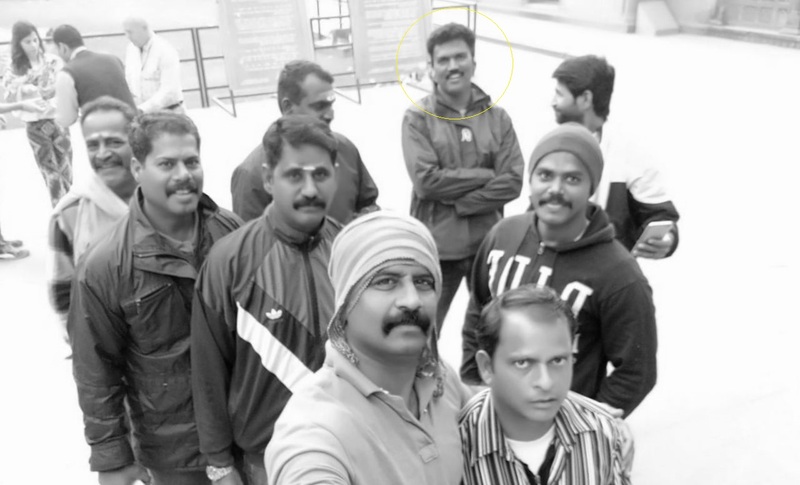 In the melee, one of the accused snatched the pistol from him and opened fire on Periyapandi's chest at a close range," a high official is quoted as saying. Chief Minister Mr Edappadi K. Palaniswami announced Rs. 1 crore compensation to Mr. Periyapandi's family. Salute and bow to Mr Periya Pandi. Pray to God to give his family the mental strength to bear this colossal loss. A photo of the valorous cop Mr Periya Pandi, reportedly taken recently as the team reached Rajasthan in pursuit of criminal ~ sad, he is snatched away cruelly when so young ! The film Theeran is based on Operation Bawaria against organized dacoity, murder and robbery that were prevalent in residential areas near the National Highway during 1995 - 2006. Director General of Police Mr S. R. Jangid along with ADGP Mr Sanjay Arora led a team to investigate. In a daring raid of a house in Kannauj in the early hours Bawaria was nabbed and subsequently his members too were. A big salute to Police forces ** ~ in school history lessons, students should be reading the real-life incidents involving these heroes which will inspire the future citizens.